Say it loud and say it proud the New Orleans Saints are Super Bowl champions. The Aints tag is gone forever, after the Saints scored 25 second half points against the favoured Indianapolis Colts. Yes this is Louisiana’s time, and for owner Tom Benson it is a dream that has come true. I loved Drew Brees coolness after going 10 points down in the first period, and I loved Tracey Porter’s pick six, but Sean Payton’s decision to go for that onside kick showed bigger balls than a man with a broken leg doing the Pamplona Bull Run. Now Drew Brees will get the headlines but to me there was one guy who the New Orleans Saints owe a game ball to, special teams dynamo Chris Reis #39. Reis recovered an early Courtney Roby kick return fumble and then was at the bottom of the Super Bowl’s biggest ever pile to recover that third quarter onside kick. He also got at least one special teams tackle that I can remember. Chris Reis take a bow my friend you are a Super Bowl champion and you will soon be fitted for a ring with a Saints logo and probably the phrase ‘ Who dat’. For the Saints the ‘Who dat’ tag is now gone forever – they are champions. Time for bed for me here in England as it has just gone 3.00am. 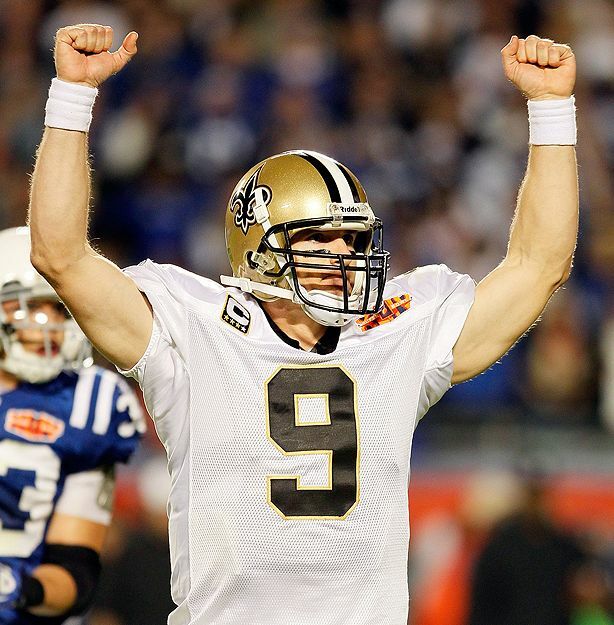 PS – I did predict a Saints win and Brees to be MVP !!! This is a pick from the heart not the head. Super Bowl Sunday – no feeling like it. It’s history, it’s drama, it’s the personification of the American dream, and above all it’s only hours away. I had predicted a Ravens v Eagles Super Bowl, and an Eagles win. I did predict the Colts making the final four, but then again I also predicted the Falcons to be playing in the NFC Championship too. Now we have the most offensive Super Bowl in history, completely smashing into tiny pieces the old adage that ‘offense wins games and defense wins championships’. The Indianapolis Colts are back in the Super Bowl just three years after they beat Da Bearz, complete with the NFL MVP at quarterback, and around half of the current team boasting a giant ring with a big blue horseshoe on it. The New Orleans Saints are at the big dance for the first time in their history, having suffered many years of futility, embarrassment and playoff heartache. Despite the recent history and the post season experiences of both teams this is not a David v Goliath battle, it is a match-up of the two highest octane offenses in the NFL. Just about the only thing that may slow down the Colts and the Saints from scoring 50 points on each other is the fact the game is being played outside in grass, and not on the speedy artificial surface that the two finalists are accustomed to. Both teams are equally capable of falling behind by 14 points and then scoring two touchdowns in under three minutes to tie it back up, without even breaking into a sweat. Both Drew Brees and Peyton Manning can win this game, and both can be ruthlessly efficient. Both have big arms, big hearts and their internal computers are faster than the ones in that room Matthew Broderick broke into in ‘War Games’. Peyton has a ring and knows what it takes. I don’t think I can recall a Super Bowl with this many game breaking wideouts on both teams (deep breath) Marques Colston, Devery Henderson, Lance Moore, Robert Meachem (Saints) and Reggie Wayne, Austin Collie, Pierre Garcon (Colts). We then move onto TEs, and this is where Dallas Clark does outdo Jeremy Shockey. Joseph Addai was a rookie in 2007 and he was part of a two-headed rushing monster (with Dominic Rhodes) that won the Colts the Superbowl. Addai has not stepped up much further, but that is because he is not asked to do any more than be part of the offense, not the focus. His support act is rookie Donald Brown, who could surprise today. The Saints have a troop of backs that are built for every situation. Reggie Bush has the hands and the speed, Mike Bell has the nose for a first down, Lynell Hamilton could be a fantasy td thief and we cannot forget Pierre Thomas, who when given bigger responsibility is nothing but business like. Its gonna be a fun game for sure, and it comes down to two key factors – which defense will cause the most turnovers and who can get a running game to step up and keep the clock running on long drives. My head says the Colts, but my heart says the Saints. I just have a feeling that the Saints defense will play the game of their lives, with Jonathan Vilma all over the field and Darren Sharper showing his true talent. 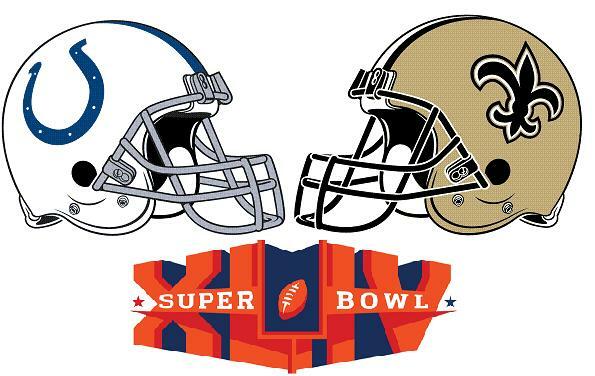 My Super Bowl prediction is Saints 33-28 Colts – MVP Drew Brees 3 td passes and 311 yards passing. It’s one of those inevitabilities that if a quarterback has a good game and is on the winning side, the likelihood is that they will get the Most Valuable Player (MVP) award at the Super Bowl. Out of the 43 Super Bowl MVP awards given, 22 have been awarded to qbs. In many cases they have been deserved (Joe Montana, Tom Brady, Doug Williams). Sometimes the QBs winning the MVP award have not been deserved, and won instead as the result of being ‘the most popular’ or ‘as a reward for their outstanding season’ (Eli Manning, Mark Rypien, Bart Starr’s 2nd Super Bowl). The QB MVP monopoly has been broken up over the past six seasons by one other position only – wide receiver. Deion Branch (Patriots), Hines Ward and Santonio Homes (both Steelers) have shown that another position outside QB can be a game breaker. Unsurprisingly the last defensive player to win the MVP award in the big game was Dexter Jackson the Buccaneers safety (2003). Why Reggie? Well he is without doubt the most exciting player to take the field in Miami on Sunday. He can run, catch and return punts. He has raised his game intensity level in the playoffs to an unprecedented level, and has the speed, hips and vision to score from anywhere. If he gets to touch the ball over 20 times he should score twice and the rest could be history. Why Darren? Sharper has had one of those once in a career seasons, kind of like Ed Reed has done in the past, by being in the right place at the right time pretty much every game. Sharper is the defensive leader of the Saints, along with Jonathan Vilma, and remarkably this will be his second Super Bowl, having been to the big dance with the Packers (as a rookie). Sharper gets two game changing interceptions before the 4th quarter and he could be da man in Florida. Why Pierre or Austin? With three out of the last five MVP awards going to wide receivers there seems to be a movement to rewarding the speed demons. The growing trend of teams using a ‘running back by committee’ approach has removed running backs from MVP consideration, with the last RB MVP being Terrell Davis (Broncos) in 1998. Under this philosophy Reggie Wayne looks to be the ideal MVP candidate, as he is the #1 WR. Thing is Wayne has had a relatively quiet post-season, and in his place both Austin Collie and Pierre Garcon have stepped up and Peyton Manning has the pair looking like All-Pro starters. Both or one out of Collie and Garcon could easily go over 100 yards and 2 touchdowns before the Super Bowl is over. 9 or 10 catches by either (depending on the coverage they get) could make them MVP winners. With NFL MVP Peyton Manning tossing the pigskin anything is possible. If I had to go for just one player I’d pick Pierre Garcon. 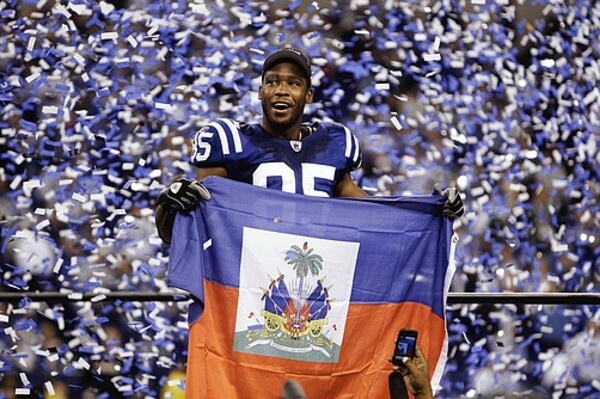 With his Haitian roots and worldwide support, this could be the biggest and best fairytale ending ever (better than Elway and Jerome Bettis’s fabled stories put together). Cant wait for the game, likelihood is that I wont win a bean, but hey you have to be in it to win it! I do have to admit that I love a little flutter during Superbowl week. Betting on who will win the Superbowl or what the winning margin will be is not much fun as the odds are so short. Instead I like to spend some of my hard-earned cash on two different bets – ‘First touchdown scorer’ and ‘Most Valuable Player’. The obvious MVP bet is always the quarterbacks, and Manning and Brees will likely be around 3-1 or even 2-1 once the odds get pushed out by UK bookmakers. I tend to go for wide receivers for MVP as you can normally get 10-1 up to 30-1 depending if you pick a Pro Bowl wideout or a slot man who might just blow up in Miami. I last won big a few years ago when I predicted WR Deion Branch to be the MVP for the Patriots. I won over £100 and sensibly spent the winnings on a pair of bedside clothes cabinets. Regarding the first TD scorer, the last time I got it right and won some money was when L.J. Smith the Eagles TE opened the scoring against the Patriots connecting on the end of a Donovan McNabb pass. Lynell Hamilton Saints RB (rushing or receiving td) – Odds 25-1 – The guy is used as a goal-line back go figure! Jeremy Shockey Saints TE (receiving td) Odds 16-1 – Shockey would like nothing more than setting the tone. Donald Brown Colts RB (rushing or receiving td) – Odds 25-1 – Its a toss-up with the Indy running game, I like this rookie however and see him doing something great in this game, so why not the first 6 point score! I know only one can possibly payout, and there is no science to it at all, but it sure makes the opening few possessions a whole load of fun. The MVP odds have not been worked out by some UK bookies so I will have to wait until the weekend to place a small wager. If any of you do decide to match my betting and you win I want 10%! If you lose then I have no idea what on earth you are talking about – what blog post? It has been a while I admit but it’s time to get back to the crystal ball gazing lark and give some NFL predictions. Plenty of juicy matchups for week 9 in the 2009 NFL season, but my personal favourite is the Philadelphia Eagles against the Dallas Cowboys. Everyone loves a bruising NFL East battle, and this one looks set to be a humdinger. My prediction for the top performers in Week 9 goes to the Iggles WR pairing of Jeremy Macklin and DeSean Jackson. I am going for Macklin and Jackson combining for 200 yards and two touchdowns in a monster win. Not so long ago the Eagles had strength pretty much everywhere apart from WR. They went and got TO and got all the way to the Superbowl. Now they have invested big in two remarkably similar types of players on the outside, but ones that could dominate for many years and become the new Fitzgerald and Boldin or Stallworth or Swann (providing they pick up some Vince Lombardi trophies in the next five years). After three weeks of predicting I was 28-20. Now for the business of the day….